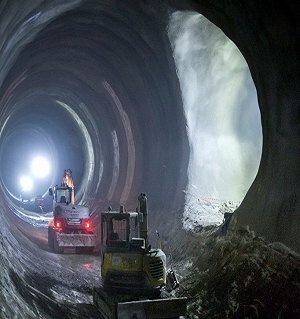 Balfour Beatty is celebrating the successful completion of the tunnelling works on the Crossrail scheme. The company worked in partnership with Morgan Sindall, Vinci Construction and BeMo Tunnelling. The project was completed on June 5 and Mayor of London Boris Johnson was there to mark the occasion. Prime Minister David Cameron and Transport Secretary Patrick Mcloughlin also attended. Eight boring machines were used during the construction; they each weighed a thousand tonnes and together they were an essential part of the construction of the 26 miles of tunnels that will make the Crossrail link possible. The final part of the construction work began on 23 May when a tunnel was created at Farringdon. The Balfour Beatty partnership finalised the tunnelling project with the work carried out at Liverpool Street and Whitechapel stations. The Crossrail link stretches from Reading to Shenfield; it is scheduled to open in 2018 and services will start in 2019.